A stunning three bedroom detached Victorian Villa featuring a spacious, open plan, luxury appointed kitchen with central−island and breakfast bar overlooking an attractive rear garden. Having been recently remodeled and refurbished throughout, there are many features such as wood flooring with underfloor heating, custom built−in media units, plantation shutters, luxury appointed bathrooms and a high standard of tasteful d飯r throughout. Located close to Esher’s cosmopolitan High street and the mainline station is within only a short drive. Altogether, a beautifully presented home offering the very best in style and comfort. Accommodation comprises; Hallway with storage, cloakroom w.c., living room with bay window, custom storage units housing flat screen TV and attractive contemporary gas fire, Sliding doors into open plan luxury appointed ‘light grey’ Shaker style kitchen with contrasting ‘charcoal grey’ central island with breakfast bar, Neff integrated appliances; oven, microwave, induction hob, wine storage, fridge freezer and dishwasher. Living area with built−in storage, wall mounted TV, sliding doors onto the garden. Upstairs; Impressive Master double bedroom with a valuated ceiling, built−in wardrobes and luxury appointed fully tiled ensuite shower room with walk in shower and vanity sink unit. Second double bedroom with fitted wardrobes, single bedroom with fitted wardrobe, luxury appointed fully tiled family bathroom with vanity sink unity, shower over bath. Outside; A fully enclosed private rear garden with a lawn area, patio area and a large raised terrace ideal for al−fresco dining and entertaining, surrounded with prominent planters with various plants to include attractive bay trees, smart cedar wood panelling with discreet contemporary garden lighting make this area a very attractive area to relax, concealed built−in useful storage sheds. The vibrant town of Esher offers many high street brands, Waitrose supermarket, independent boutiques, local gastro−pubs, Everyman cinema and many notable restaurants. The larger nearby towns of Kingston and Guildford offer more extensive shopping and recreational facilities. There are numerous private and public local golf courses, Sandown racecourse is nearby with its internationally renowned horse racing as well as a ski centre, cafe and a children’s activity centre. There are many excellent local schools, both state and private, including ACS International School at Cobham Feltonfleet, Reeds, Claremont Fan Court and Danes Hill School. Esher station, with frequent and fast links to London Waterloo is within a 5 minute drive. Central London is 18 miles away, with the A3 and M25 within easy driving distance. Gatwick and Heathrow airports are within easy reach. EPC rating To be advised. 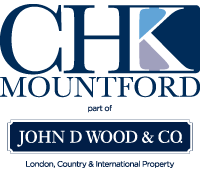 All viewings are strictly by appointment with CHK Mountford. Please note that any information contained within these particulars, or given verbally by CHK Mountford or their representatives is given without any warranty and negotiations are on a subject to contract basis until a tenancy agreement has been signed by both the landlords and tenants. Satisfactory references are always required before a tenancy agreement is signed. In addition to the rent and security deposit please note that administration charges are payable, please contact our office for further details.